Helping our clients meet their goals is one of the best things about working at a content marketing agency. Many clients come to us with initial goals of increasing their social media presence, gaining more followers and pulling in traffic to their websites. So when one client in the online education space asked our Promotions and Engagement team for help growing its follower base and improving brand awareness through social media, we knew exactly what to do*. But the client – and we – got more than we bargained for. In a great way. After looking at the data, the results we saw were astounding. Not only did we bring in more followers, but our social efforts significantly drove traffic to their website. All within three months. A double win is always a good thing. Let’s take a look at some of the data behind the social strategy. *Disclaimer: We are sticklers for creating commercial objectives around your marketing goals. These stats are strictly vanity metrics and don’t yet prove actual monetary gain for our client, but we’re not ashamed to show how we helped them meet their initial goals. Post around 5 Tweets per weekday. Post around 2 Facebook posts per weekday. Share blog posts from their own site, as well as other relevant sources. On Twitter, we used relevant trending industry and event hashtags, and the top Tweets we shared featured a variety of both the client’s content and content from other industry professionals. Through this, as well as frequent posting, we saw a total of 3,507 engagements (retweets, likes and replies) and around 4,400 impressions. 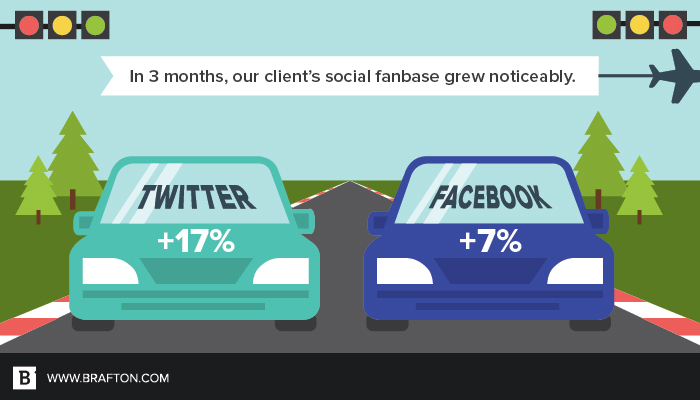 By the end of the three months, there was a 17 percent increase in Twitter followers! Mission accomplished (well, at least the first step)! And something else nifty happened: Due to engagement and follower growth, the client’s influencer score also increased, from 54 in the previous quarter to 56. This score is very competitive and a good place to be. Now on to Facebook. While not as active as Twitter in terms of follower increases and engagement, we still saw a significant growth. The same method of posting client and other industry content boosted Facebook followers by 7 percent. In terms of engagement, there were 1,409 reactions and 994 shares. Yet another great accomplishment! Here’s where we get to the good stuff. We saw that while we were reaching the client’s goal of growing their social media followers, our efforts also increased traffic to their website. This wasn’t a main goal for the client at the beginning, but after seeing the stats, they (and we) aren’t complaining. 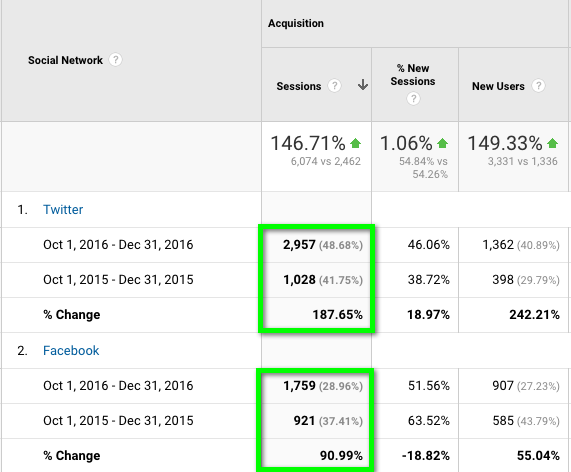 Compared to Q4 2015, social media drove an insane amount of traffic to the client site – 147 percent in fact! When we break it down, the results are even more staggering. Twitter drove 188 percent more traffic to the site, while Facebook boosted its traffic by 91 percent. 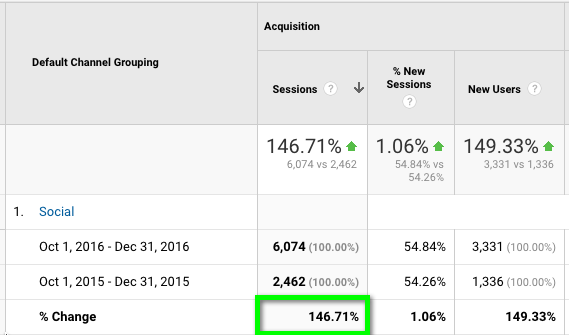 This is definitely something we were excited to discover, as we not only helped our client meet their initial goal, but we also grew their site traffic a lot. By focusing on a strategic approach of posting frequently, sharing the client’s content as well as that of others in their industry, and making use of popular and event hashtags, we were able to increase social followers and the Twitter influence score. BUT at the same time, those efforts had the unintended – but still awesome – effect of significantly growing the client’s website traffic. Again, we want to reiterate that these metrics are highlighting only aspects that don’t yet equate to monetary gain. Attaching commercial objectives, such as turning these increased follower counts into more customers, to your marketing metrics and goals is the only way to see tangible results for your hard work. With that said, these stats are a great early step toward fulfilling results-driven marketing goals. Want to learn more about how a defined strategy can bring you social media success? Check out our Social Media Marketing page for more details!